You are here: Home › Forum › Teachers › Do we know enough about internally displaced people to include them within education systems? Do we know enough about internally displaced people to include them within education systems? 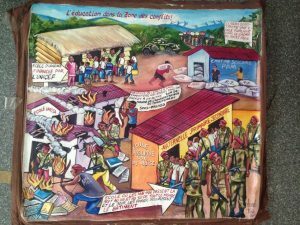 The canvas was commissioned by the author, Cyril Owen Brandt on Kinshasa’s art market and represents aspects that occurred in his research. It was drawn by Aundu Kiala. This blog was written by Cyril Owen Brandt, a postdoctoral researcher at the Institute of Development Policy, University of Antwerp. First, who else is overlooked, and why? For starters, some countries generally have little knowledge of their population: people and even civil servants can be unknown to state administrations or international agencies (Brandt, 2018, Kalir and van Schendel, 2017). There can be various reasons for this phenomenon: an absence of censuses, bureaucrats who benefit from unreliable and incomplete payrolls or, for example, people hiding from the state. On top of omission, cases of commission add to imprecise knowledge: fictious schools and teachers facilitate embezzlement of public resources. Building on research in these areas can possibly help to build a relevant knowledge base for further research on overlooked IDPs – to avoid linking the ‘overlooked’ factor only to geopolitical concerns. Second, not all IDPs are overlooked, which raises the question ‘How do projects and policies look at IDPs?’ A qualitative analysis could be helpful to analyse the dominant frames that portray IDPs. As a case in point, research suggests that ‘resilience’ is an increasingly popular way to see IDPs (Lopes Cardozo, 2015). Further research is needed to uncover what the idea of resilience implies for IDPs who live in situations of protracted crises and structural violence for extended periods. Third, what is the link between available knowledge and practice? Li (2005) illustrates that the relationship between knowledge and interventions is not straightforward. In my research on internally displaced teachers in the DRC, I argue that state and non-state actors push internally displaced teachers to return, under the threat of removing them from payroll. Teachers return to work in precarious and sometimes dangerous conditions. As a note for practitioners, in the article I conclude that “Programmes should try to include administrators in their activities without becoming accomplices of government actions that risk teachers’ lives”. Since administrators are pivotal in overseeing teachers’ returns, this can seem impossible. Drawing on Li, my point here is that available knowledge is only one factor that informs possible actions. It could thus be worth analysing more closely how practitioners manage the little and challenging existing knowledge on IDPs and education – in contexts ripe with direct and structural forms of violence. Brandt, Cyril Owen. (2018). “The Deployment of Internally Displaced Teachers (DR Congo): A ‘Real Governance’ Approach.” International Journal of Educational Development. Abstract online. Brandt, Cyril Owen. 2018. Illegibility as a State Effect. The Limits of Governing Teacher Identification in the Democratic Republic of Congo. University of Amsterdam, PhD Thesis, Available online. Kalir, Barak, and Willem van Schendel. 2017. “Introduction: Nonrecording States between Legibility and Looking Away.” Focaal – Journal of Global and Historical Anthropology, no. 77: 1–7. Li, Tania Murray. 2005. “Beyond ‘the State’ and Failed Schemes.” American Anthropologist 107 (3): 383–94. Lopes Cardozo, Mieke T. A. 2015. “Education as a Stronghold? 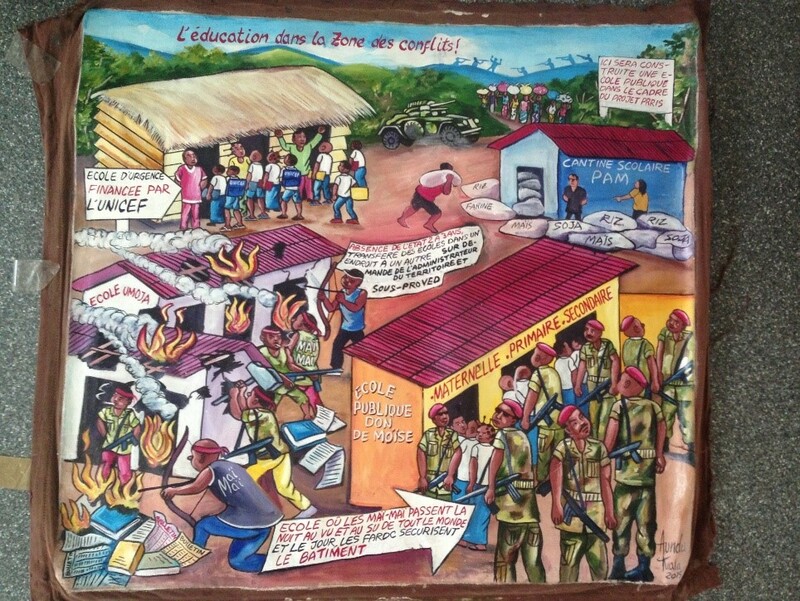 The Ambiguous Connections between Education, Resilience and Peacebuilding.” NORRAG Policy Research Note 2.